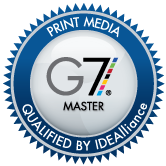 G7 Master Printer Qualification is granted to print marketing facilities proven capable of performing the G7 methodology on proof and press by a certified G7 Expert. G7 is Idealliance’s industry-leading set of best practices for achieving gray balance and is the driving force for achieving visual similarity across all print processes. The application of this method enables us to reproduce a similar visual appearance across all printing types and substrates. RBO PrintLogistix offers digital and offset print services. Already an efficient print provider, we looked to the Idealliance G7 Master Program to achieve further productivity gains to better serve our business customer’s objectives for brand color quality and control. Who are G7 Qualified Master Printers? They are skilled, tested, and proven leaders in print production. They are experts in matching proof-to-print across any process, ink, or substrate. They deliver print at the highest levels of quality based on global standards. They deduce costs, speed product to market, and improve brand image. What is G7 Qualified Printing? A method where all print has a similar appearance. A method used to consistently hit desired color targets. A method designed to align all devices, substrates, and inks. RBO offers a full-service digital print solution on site for black and white to full-color printing. Our Web to Print service directs orders straight to the production software in our digital output center where they are printed, sent to bindery, packaged, and combined with warehouse shipments on a daily basis. Once your product is on its way to you, a shipping order confirmation email will be sent to the person who placed the order.